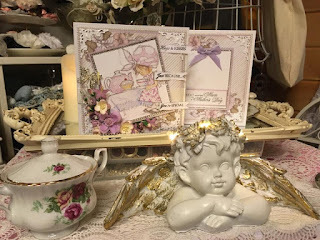 It has been so long since I blogged, and in truth I have pretty much forgotten how to do everything, linking pages etc, so it will be a slow process, but I hope it comes back to me, albeit slowly !!! 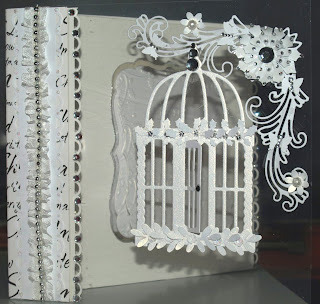 Due to lots of things going on in my personal life, I gave up blogging, and for long periods of time my crafting too. But, now I feel its time to get back to my love of crafting and to share my projects with others who have the same love of crafting. I may have only just got back into it this time, but will have past projects to share with you too. A couple of stamped tags using my distress pads. Two more tags. The first was only one sided. Displaying a handmade flower I had made some time ago. 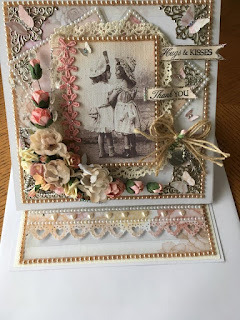 The second tag, using one of the Elisabeth Stamps, I still adore all of her designs and have been enjoying using them again. I am running a give away on my You Tube Channel, the closing date for entering is the 6th April. For a chance of winning you need to subscribe to my channel and leave a comment. Sharing the giveaway is not necessary but would be appreciated. Good luck. 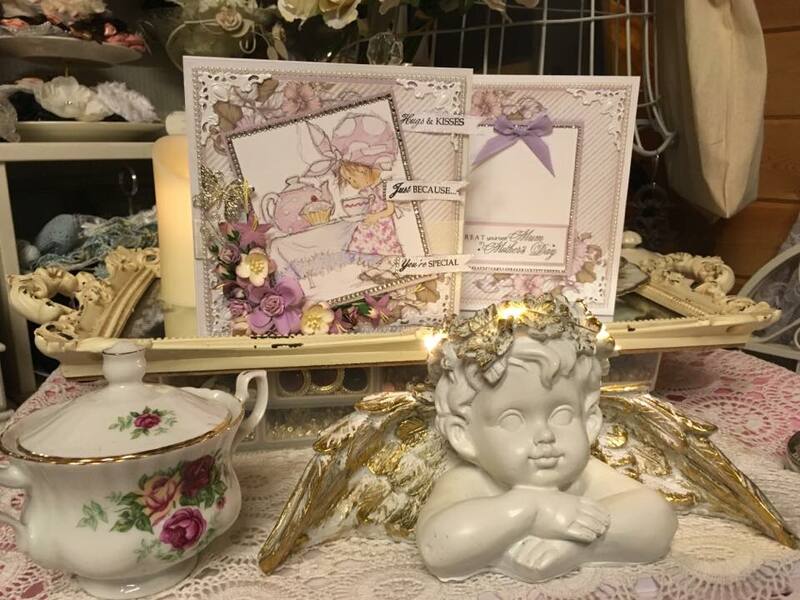 Details of what you will win are on the video, it will include one of the Doily Lace books I have made and a collection of other crafting goodies. Will be announcing the winner on the 7th April, which is my Grandsons 2nd Birthday. Good morning, and welcome to my blog. I am slowly sorting out in my mind what I want to do. I finally realized that although I did take a fairly long break from my crafting, I don't think I could ever give it up completely. With life in general events do put life into perspective, and after losing my dear Mum almost 2 years ago, I decided to spend and appreciate my family even more than I already did. With that in mind I took a long break from my crafting and did plan on giving it up completely. I am now glad I didn't. I have always been uncomfortable with "who I am" not liking the way I look, talk etc, etc, but I think this is true of a lot of us ladies. I have always hated the camera and seeing myself or hearing myself. So the fact that I had wanted to do a You Tube Channel did not make any sense. I have finally realized, I am who I am and can not change that, I have to accept what I look and sound like, and so what if people don't like me, that's life. It all sounds very easy when I read it back, but in reality it isn't as easy as it sounds. Reaching 50 last year may be what has sparked this new belief. So finally I decided last week to go for it. I did my first ever You Tube video, if you would like to take a look the link is below. It took me a week literally before I could watch or listen to it, all the way through . My daughter edits and loads my videos as I rely on using her recording equipment. For this reason I will only be loading once a week as she has study commitments. So I have decided to use my blog again to share Car Boot Hauls, before and after shots of altered items from the Car Boot, and anything else I want to share with you all. I would love to see your comments and will be running regular give aways on here and my You Tube Channel. Thank you for popping by and I will be back soon with photos of some recent projects. Can not believe its Friday again already, where did this week go? Thought today I would share with you another card we made when we were away for the weekend. I used an image that had been coloured in by the lovely Heather, who was my weekend away partner! I made my own background using the wonderful Cosmic Shimmer Mists and then stamped the swirl which is part of the Creative Expressions plate, using the marmelade distress ink pad. 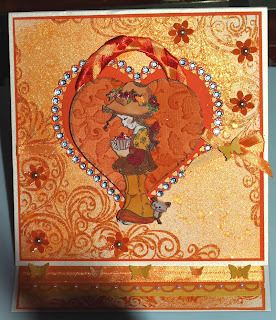 Turned it into an easel card and the inside is pratically the same as the outside without the image! Today we are Celebrating my lovely Bear's 3rd birthday, happy birthday my lovely baby, and thank you for bringing so much joy into my life. 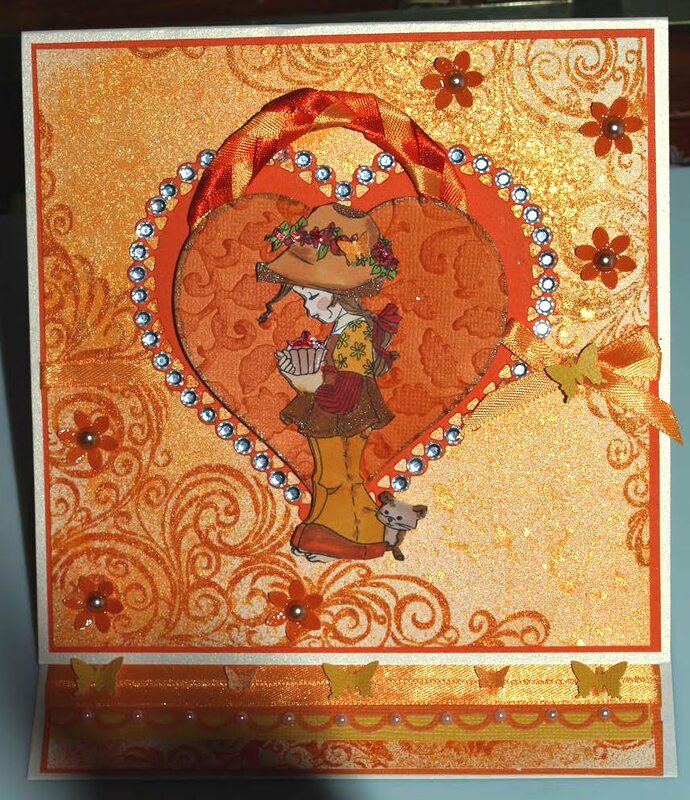 Well ladies hope you have a lovely weekend, will be back later to share some more cards with you. Good evening ladies, I can hardly believe I'm doing another post. 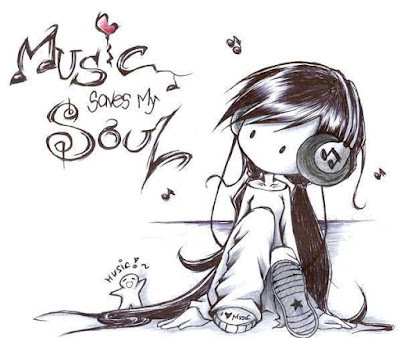 This time not only a card but I am also taking part in the lovely Marceas - Music Saves My soul Saturday, which I came across this evening. Of course I realize its not Saturday but I am always late! I am a huge Westlife fan and was very sad to hear of the break up this week. My favourite all time song is Flying Without Wings, which I decided to share with you. Why not join in with this weeks Music Saves My Soul and share with us your favourite track. Back tomorrow with another card to share. It has been a week since I got home from the crafting weekend, and other than a brief post, I did not get chance before now to show you one of the cards I made. If you have been reading the weekend blog, you will know we didn't get to craft quite as much as I had intended, far too much chatting going on, and a severe lack of inspiration on my part. This was the last card I made, and the one I was happiest with. 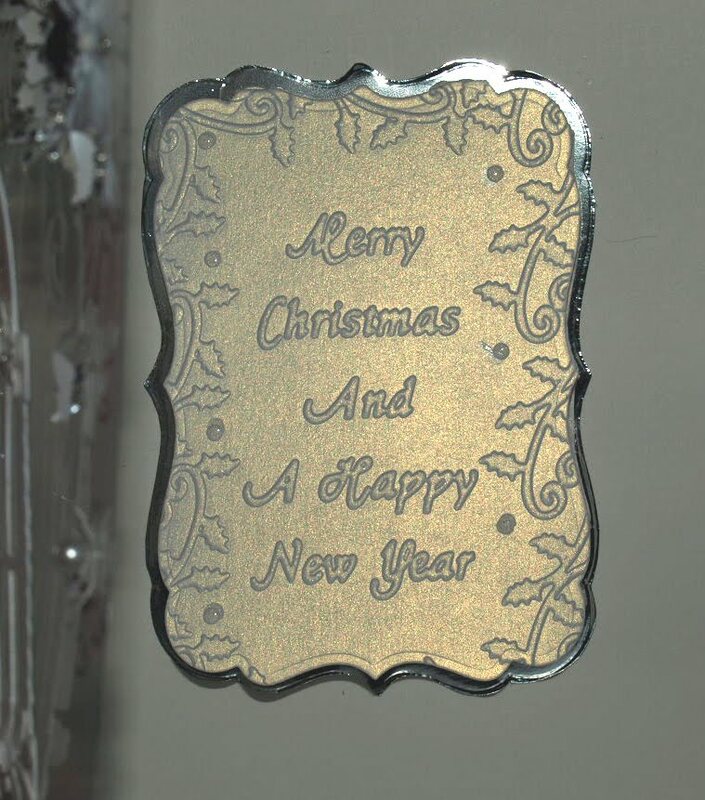 Using some of the fabulous gold/white greetings card and the embossed happy christmas card I made this take on an acetate card. I am just loving the use of acetate in my cards at the moment, and these dies lend themselves perfectly. The wonderful bird cage die has been one of my favourites, I have used it in lots of my workshops, I will be back later this week with more of the cards Ive made using this beauty. 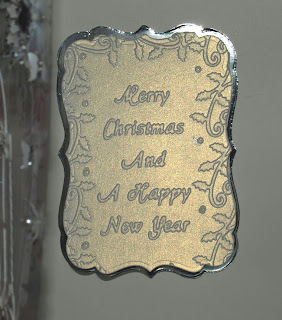 I love the Cheerylynn flourish die too which is soooo elegant and one of the Crealies flower dies too which I just find scream for gems to decorate! EK success flower punch dies and a gorgeous butterfly punch too which the lovely Sarah let me borrow. I think I've finally tracked one of these down now Sarah, can't wait for it to arrive. I have used one of the nestabilities to cut out the frame, and embossed it with an embossing folder that I borrowed , and don't know which brand - sorry! You can not see from this picutre, but you can open the book to write inside your message. I hope you've all have a lovely weekend, I will be back later in the week, with a few challenge cards (fingers crossed) and also the other two cards I made while I was away. PS. If anyone wants any other details on the dies i've used, or to purchase, please email me at littlepopits@aol.com.